The Viking earrings that we offer here make the perfect finishing touch for your look and pair well with our other pieces of Viking jewelry, as well. Many of our Nordic earring designs feature elements inspired by Norse mythology, culture, and art, including Viking knotwork, Viking axes, Viking shields, and more. 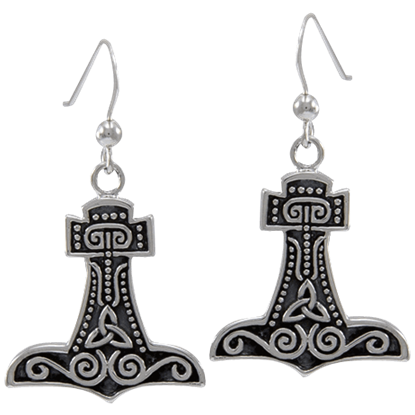 We carry styles of Viking hook earrings and Viking post earrings, and most of our pieces require pierced ears to wear. Browse through this growing section to see fantastic pieces for adding Viking flair to any costume or outfit! 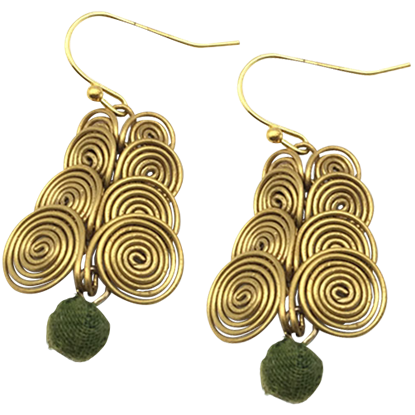 Lend unique elegance to Viking looks with the Golden Swirls Norse Bead Earrings. A fabric-covered wooden bead hangs from the layered, gold tone swirls, creating a rustic yet refined vibe perfect for accessorizing a Norse lady look. Mjolnir, the hammer of the Norse god Thor has been viewed as a symbol of strength for centuries. 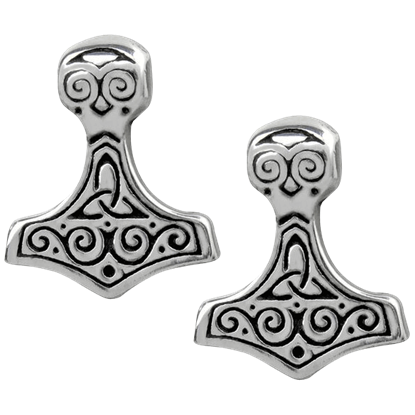 Granted the power of this Norse god, the Hammer of Thor Pendant Earrings is a unique way to bring a Viking touch to your everyday life! 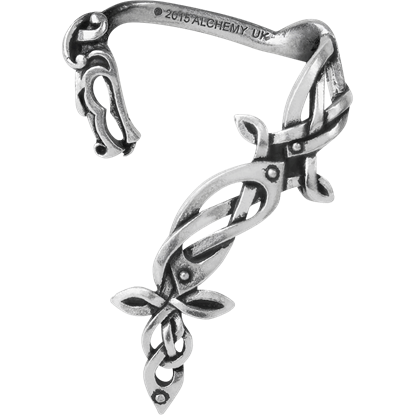 The striking interlaced knotwork dragon design of the quality pewter Osberg Dragon Ear Wrap is inspired by the intricate Norse wood carving that decorated a 9th century Viking ship discovered beneath a burial mound in Norway. 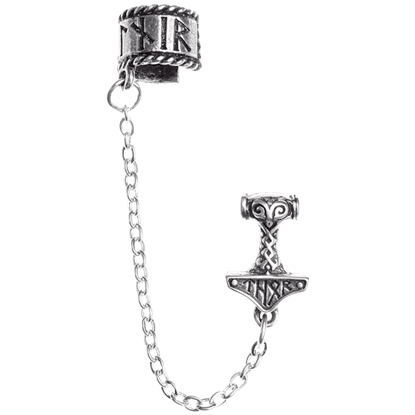 The intricate skills of the Norsemen jewel smiths are invoked here with the precision of the miniature Thors hammer earring, connected with a delicate chain to a pewter cuff. The Thor Donner Chained Earring may be worn on either ear. Mjolnir, or Thors Hammer, is an ancient Norse symbol, a stylized depiction of the Gods magical weapon. The Thor Hammer Earrings are inspired by a Viking Age pendant displaying a triquetra in the center, with spirals above and below. The Viking Beaded Swirl Earrings are high quality, handcrafted jewelry pieces well-suited for creating the look of a fine Viking lady. 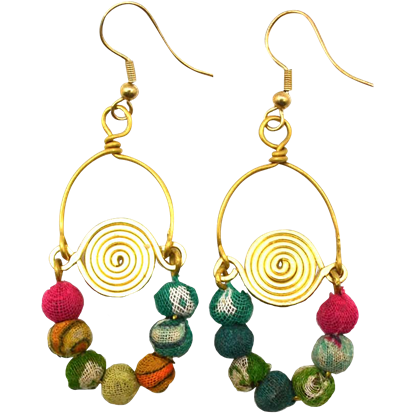 Round wooden beads wrapped in colorful fabric hang in a loop from their central gold tone swirl. Stylish and unique, the Viking Hearts Cloth Beaded Earrings are crafted by hand and make great additions to Norse and fantasy looks. The gold tone wire structure forms two hearts, around which are attached cloth-covered beads. In the Viking culture, the wolf was often considered a creature of Odin. Odin himself had two who served him personally. 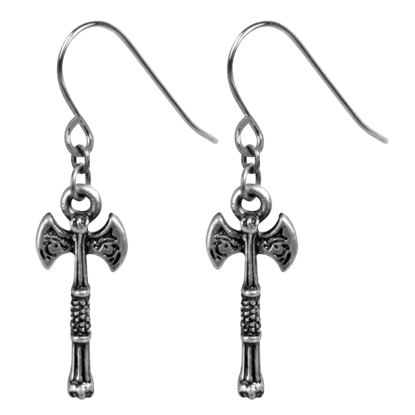 These Viking Wolf Axe Earrings embody not only these creatures but also the shape of the iconic Viking weapon. Embracing geometric knotwork patterns, Borre style artwork motifs are named for the Borre mound cemetery in Norway. 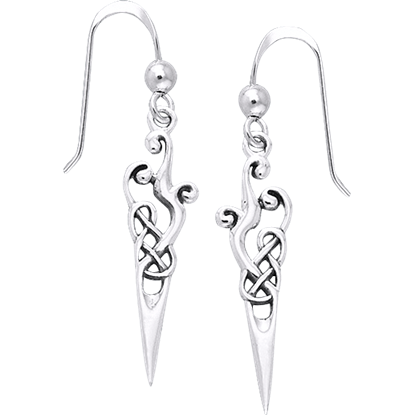 The White Bronze Borre Knot Earrings show off an attractive knotwork pattern that Viking enthusiasts will love. Sometimes called runestone style art, the Viking Urnes style features slim, stylized, tightly interwoven patterns often depicting animals. 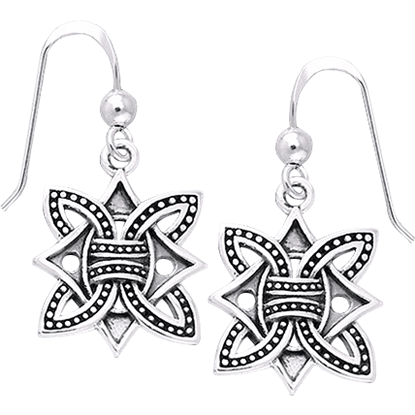 The White Bronze Urnes Earrings show off curling and crisscrossing spike designs. 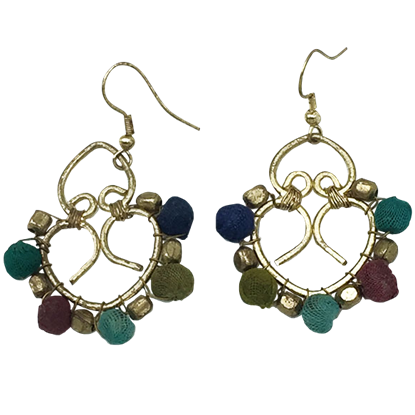 This pair of earrings, patterned after a Viking shield, offers its wearer protection just like the shield did to Viking warriors of old. 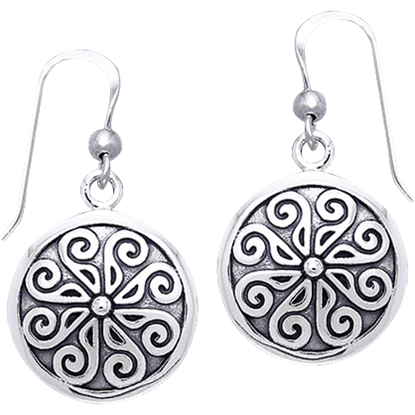 The White Bronze Viking Round Shield Earrings show off a circular shape with fine details.